Grandma Bonnie's Closet: Back to School Blowout Sale! Back to School Blowout Sale! I am so happy to proclaim I am now a So Chic Bag Boutique Consultant! I am very happy to let you in on the first news of any and all sales events. With summer vacation at an end and school starting back up everyone needs school bags. So stop over and see the great selection of school bags and while your at it you almost certainly deserve a new purse. 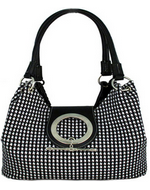 Quilted Fabric, Polka Dot Ribbon, Zip Top Closure, Fully Lined in Gingham, Two adjustable shoulder straps that can be zipped together to convert into a sling bag. 14.5"wide x 16" tall x 6" deep. If you would like to see all So Chick Bag Boutique's school supplies and or all other products. ( Handbags, diaper bags, messenger bags and even beauty supplies) select any image and you will be brought to So Chick Bag Boutique. Are you interested in joining as a So Chick Bag Boutique Consultant. Just select the banner below and you will be on your way. Add my name to the referral line and join me in an adventure. Congrats on becoming a consultant. 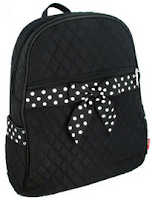 I checked out the site and they have some really cute backpacks. The accessories and bags are beautiful but I think your Etsy crochet items are much nicer. Best of luck on your new quest. They have some adorable items. Good luck with your new business.